Every photographer complains that they have no photos of their own kids because they do not take the time to photograph them and they cannot get their own kids to cooperate for them. I have lots of photos of my kids of daily activities, but I have to agree that the lack of cooperation for a nice portrait shoot is a big roadblock. The evening we set aside to do Colby’s senior portraits was a perfect example. He pouted and complained to the point that I told him he was welcome to figure out his own means of getting a Summerville High yearbook portrait. But he grudgingly came around and faked some smiles. 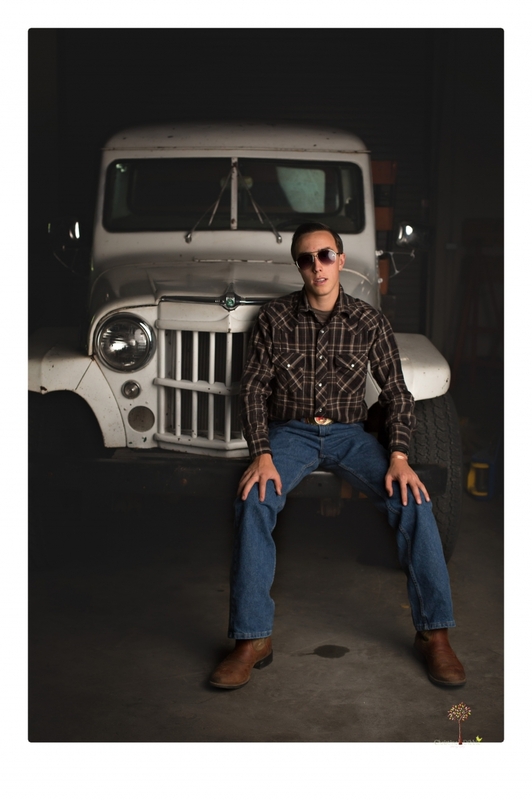 Colby wanted a session with his beloved 1959 Jeep Willys pick-up truck, but it was in need of some repairs. 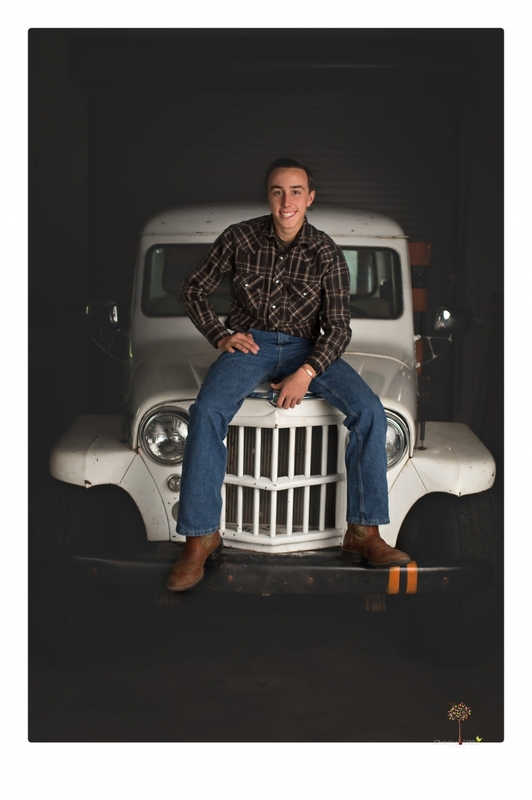 So we went to the auto shop to have some indoor portraits taken with it, and then we moved outside with his other favorite truck, a 1970 Chevy. The Willys has since been fixed, but I am now in busy season, so an outdoor shoot with that is still coming. That just means another day to hope he cooperates! Autumn Rudolph - I love the Americana / country feel of these Summerville Senior Photos! For not being too thrilled with having to take photos, I think he did a great job of “chalking it up” for the camera. 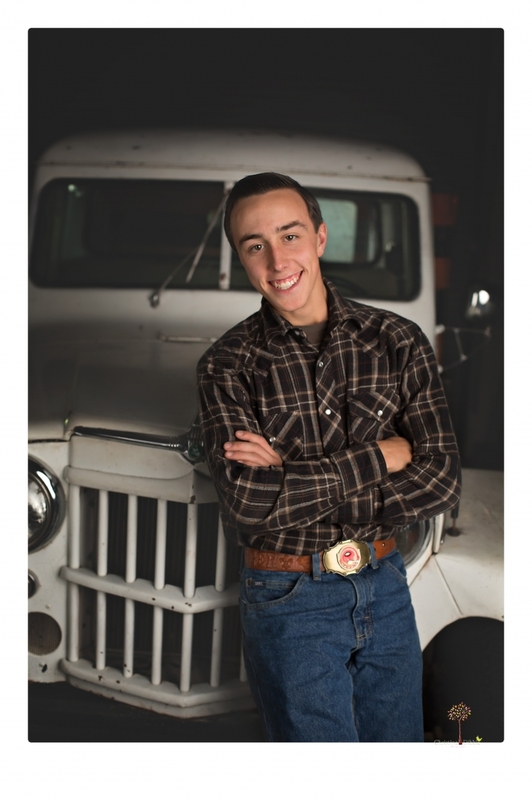 Sometimes you just have to fake it till you make it, and he’s got some great senior photos here! Allison - Wow, awesome photos — especially for a guy who didn’t want them! He’s definitely got some great options for his Summerville senior photos! Love the lighting in them, and the retro feel to them, too! Lovely work! Corey Farrar - What a handsome young man! I have always found it hard to photograph my sons – they act the same way! These are awesome though! I would have never guessed he wasn’t up for a session! Chelsey - These turned out great! He probably is having a hard time choosing which one to use for his Summerville senior yearbook photos. I love the country feel- it’s everything American! Megan Montalvo - Awesome Senior portraits! I love the country feel and moody lighting! It really plays up the masculinity. Love these!